Are there companies who will move a travel trailer or 5th wheel? Comments for Are there companies who will move a travel trailer or 5th wheel? I have a truck that is perfect for pulling a fifth wheel. I was wondering if there is a market for moving trailers for people. I live in MN so there are plenty of people that head south for the winter but I don't know if they pull there own trailer or what. So if anyone could give me some advice that would be great. I need a 31 Ft. travel trailer moved from Punta Gorda Florida to Fox Lake Wisconsin. I too need a company to move my 5th wheel trailer. What companies are located in Exeter, RI? I am located in south central WI. 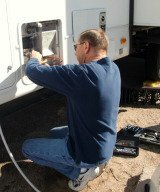 Are there any companies that move RV's or travel trailers? You don't mention where you are located. There are folks out there who do this type of thing - but are usually pretty localized. Let us know where you are in the country, maybe we can help with suggestions.